It seems every day there’s a news story about how children are getting fatter. Too much time spent watching TV or playing computer games, a fast-food diet, and too little time enjoying the outdoors are the prime culprits. But kids love exercise; you have to get them up and at it in the right way. The following top 10 tips help you do just that. When you’ve eaten your evening meal, it’s easy to flop out in front of the tube. Why not get outside instead? In spring and summer, it’s a great time to take a walk together as a family or get out on a bicycle. Take a ball to the park and play. If you and your kids aren’t used to doing that, just start with a one-off. Then next week, try saying, “Hey, that was fun the other evening! Let’s do it again.” Keep it lighthearted and optional. You only have to get them out once to get them hooked. Once it becomes a thing you do once a week, you can make extra time from there. You need not get your kids active for an hour at a stretch at first; 10 or 20 minutes at a time is all they need. A walk or run with the dog in the morning, a ball game after school, and outdoor chores before bed, for example, will soon add up. Kids today understand and love technology. A step counter (also called a pedometer) is a good way to get tech-savvy kids into exercise. If you get one for all your kids and yourself too, encourage gentle competition to see who can clock up the most steps will help motivate them. Kids love challenges, scores, and prizes. There’s no need to invest in lots of expensive equipment, but a few dollars on a skip rope, skates, a soccer ball, and even a small trampoline is a worthwhile investment. You can pick stuff up cheap from yard sales and thrift stores too. Keep your eyes peeled for any new activity gear and get a secret stash together. When the kids are complaining they’re bored, you can introduce a new piece of the kit to get them up and active again. Kids enjoy novelty. They need constant stimulation to keep them interested. Think about taking them out on brief expeditions. You don’t have to go hiking in Yosemite National Park. You could ride the bus or cycle to a park they’ve never visited. Take them to the public swimming pool. On rainy days, check out your local climbing wall, or if your kids are young, soft-play centers are a great choice. In good weather, take a picnic or a barbecue to the park or the coast. Let them invite their friends. Play Frisbee and tag games, or set up a treasure hunt. The cool thing about taking classes is the social and confidence-building aspects from which your kids will benefit, on top of the exercise they’ll get. Think about signing your kids up for a martial arts class, sports coaching, or volunteering on a wildlife scheme. The library will have plenty of information about possibilities in your area. A quick search online will turn up several options. It’s a good idea to get your kids involved in choosing classes and let them try them out before they commit. Most classes offer free “taster” sessions before you part with your hard-earned cash. Once your kids find a class they enjoy, they’ll get exercise without realizing it, make new friends, and make progress as well. There are many games geared toward getting your kids active. They can be great fun for the whole family. Systems like Wii and Kinect all have motion-sensor games for fitness, sports, exercise, and dance. You can rent them from your local games store. 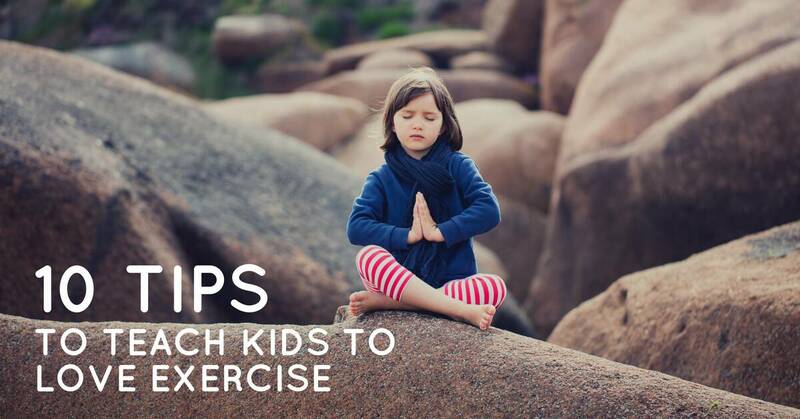 There’s no need to tell your kids you’re getting them involved in exercise. If they’re still young, just get them up and doing. Have fun yourself and they’ll most likely get carried away on the vibe. Is it snowing? Get out and make a snowman or go sledging. Is it fall? Go chase leaves, kick them up, and throw them at each other. Is it raining? Get your rain boots on and jump those puddles. A game of hide and seek, or simple chase, is always fun. Children are as individual as anyone else. One kid may love solitary swimming while another only thrives within a team. If you’re introducing exercise to older kids, take your time and be patient. Suggest new things to do, offer a range of options, and listen to any objections they raise. The key is not to nag them when they don’t do something. Praise them and express your pleasure and approval when they do. It can take time and perseverance, but you’ll get there. It’s a case of helping your kid find her element. No one, especially your kids, will take you seriously if you have a do-as-I-say-not-as-I-do approach. Lead by example. Find an activity you enjoy, and get started. Kids who see their parents taking exercise and enjoying it are more likely to adopt the habit themselves. If you’re super-smart, you’ll choose an activity they can join in with when they’re ready, such as running, cycling, or basketball. Poor fitness among today’s young people is storing up trouble for their future health — and lowering the quality of their lives today. Every parent has a responsibility to get kids up and active. Put these top 10 strategies to work today to teach your kids to love exercise.